Put the bulgur into a bowl, cover it with water, and let the bulgur soak for an hour. Drain and press out any excess water. Mix the bulgur with the onions, crushing the onions with your fingers. Add salt to taste. Stir in the herbs, the half-cup lemon juice, and the half-cup olive oil. Taste the salad, and add more salt, lemon juice, or oil, if you like. 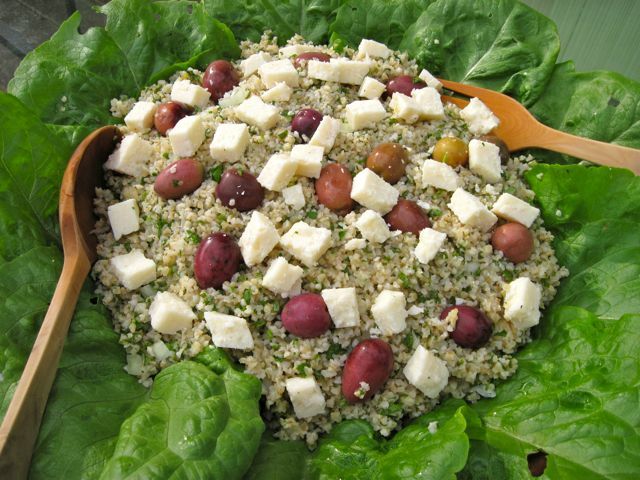 Serve the tabbouleh immediately, with lettuce or grape leaves if you like, or chill the salad until you’re ready to eat. Garnish with olives and feta or cotija cheese if you wish.